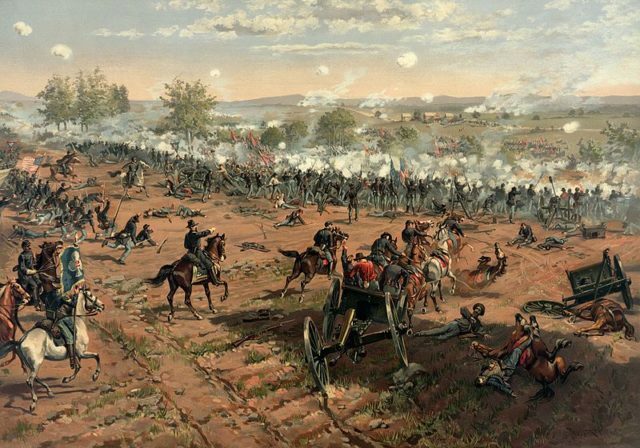 The Battle of Gettysburg was a long, brutal battle with the largest casualty counts of any battle fought during the Civil War. It also marked the turning point, where the Union Army began to get the upper hand over the Confederate forces led by General Robert E. Lee. The battle lasted three days, from July 1st to 3rd, 1863, and only ended after Pickett’s Charge went disastrously awry, resulting in the loss of about two-thirds of Pickett’s forces, and nearly half of the Confederate forces overall. Although Lee won other victories, he never really recovered from the devastation at Gettysburg. 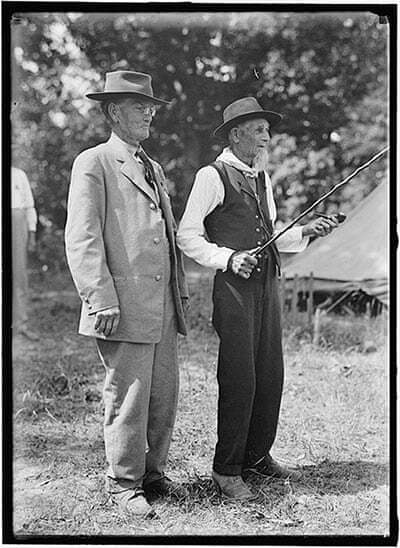 According to Mental Floss, in April of 1908, a General from Philadelphia who’d been wounded at Gettysburg and lost an arm, suggested a way to mark the observance of the 50th anniversary of the battle. 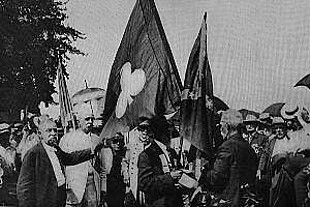 He mentioned his idea to then-governor of Pennsylvania, Edwin Stuart, who in turn presented it to the state’s General Assembly the following January, establishing the Fiftieth Anniversary of the Battle of Gettysburg Commission later in the year. 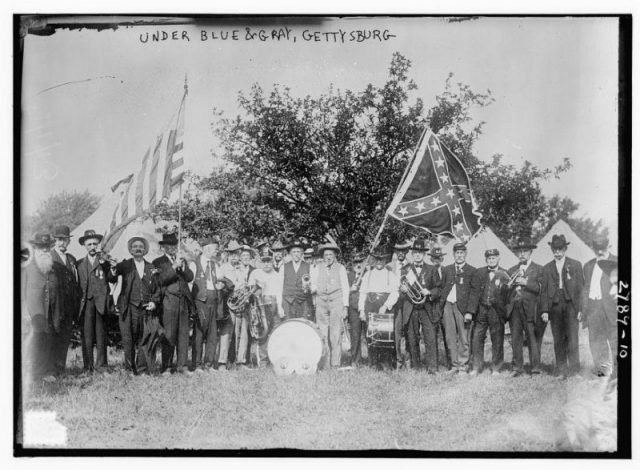 The idea was to hold a reunion on the Gettysburg Battlefield of both Union and Confederate veterans who had fought there. There had been other reunions there before, but this one was planned to be huge. The commission sent invitations to all surviving Civil War veterans, calling on the government to help fund transportation to interested veterans from other states. The Commission helped the town of Gettysburg get ready for the 100,000 or so guests that they expected would be arriving (only about half of them veterans) and staying for the event that would run from June 29th to July 6th, 1913. The arrangements and planning were more complicated than they sound. 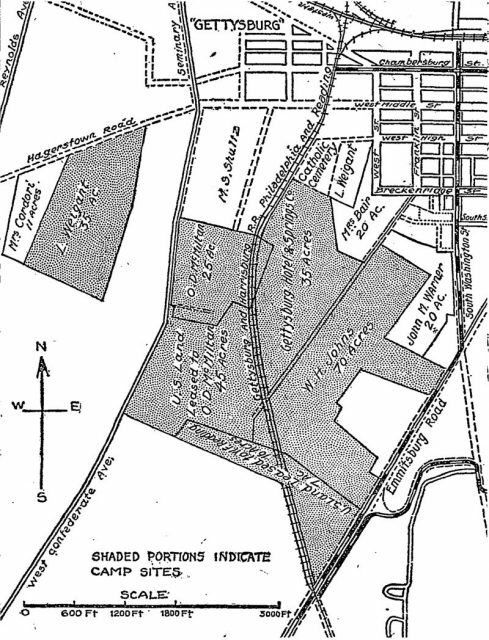 Plan for encampments of 1913 Gettysburg reunion. According to Thomas’ Legion, the expense of finding and sending so many veterans, from as far away as California, was more than many states could bear. A few states passed legislation to help fund the trip for their veterans, all of whom were old men by then, but many were forced to rely on personal donations. 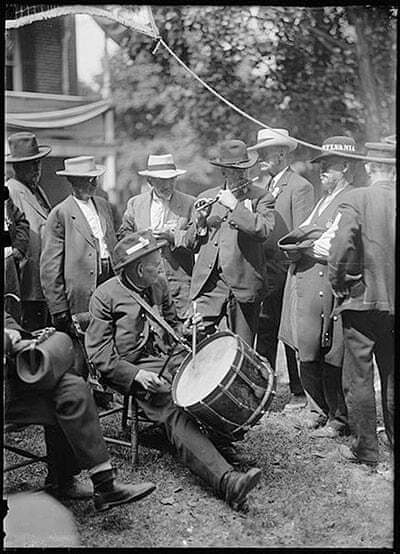 Confederate and Union veterans pass the time with a drum-and-fife corps. Even so, the burden that was being put on the state of Pennsylvania continued to grow, and the plan couldn’t have come to fruition without help from the Federal government. The camp for the veterans opened on June 29th. It was enormous, about 280 acres, with room for over 5,000 tents arranged by state. Artesian wells were installed, and each tent was equipped with two basins and a water bucket. According to the Commission’s report, during the event there were over 53,400 veterans housed in the tents. The War Department assigned nearly 1,500 military personnel to help things go smoothly. Other occupants of the village included some 155 journalists and over 2,000 cooks. Various public exercises took place under an enormous tent each day of the official event, including a reading of Abraham Lincoln’s famous Gettysburg Address, speeches, dedication of state monuments, and a fireworks display. 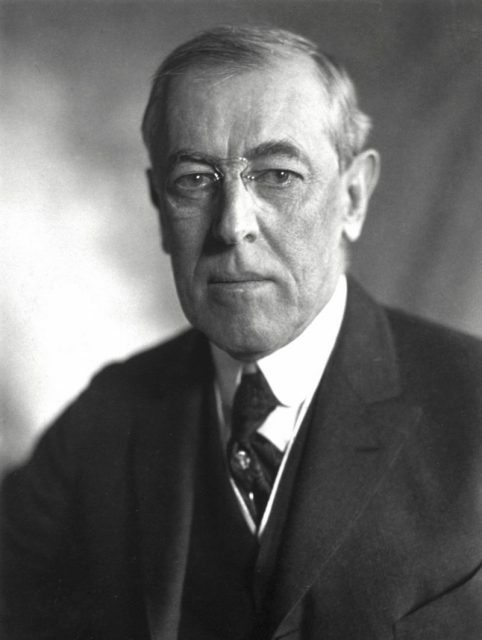 President Woodrow Wilson gave a speech on July 4th. When the men weren’t participating in the public exercises, they had ample opportunity to have mini-reunions, meeting and catching up with old friends, and having a chance to get to know some of their old foes. There were many instances of veterans looking for someone who had shot him during the battle or to exchange badges with a former soldier from the other side. Two men even went so far as to purchase a hatchet at a local hardware store and symbolically bury it in the ground where the battle had been fought. 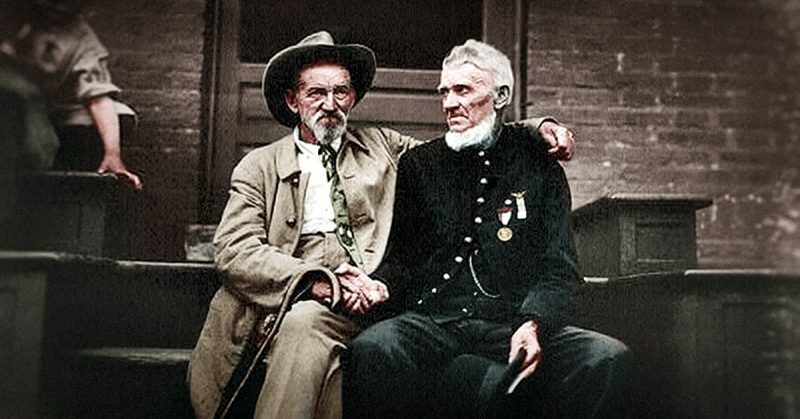 A most interesting occurrence happened when a Confederate soldier told his story to a Union soldier of having been saved by a Union soldier after being shot. The Union soldier then said that he had done that same thing for a Confederate soldier during the battle. He then went on to explain what he had done. The Confederate soldier listened and replied that was what had been done for him.